To Your Eternity Vol. 7 Review – AiPT! It’s the beginning of a cult as the main character inspires a people. 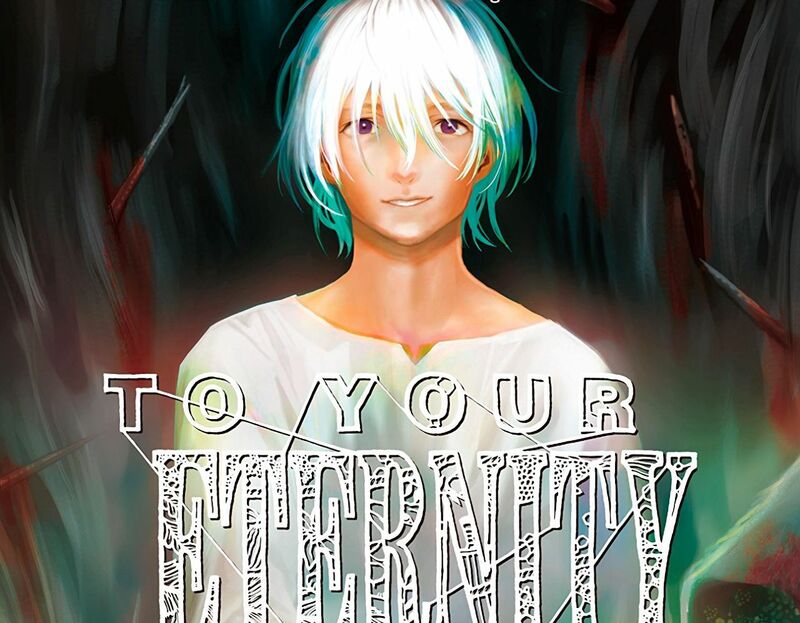 To Your Eternity has been one of the most rewarding manga reading experiences I’ve ever come across. I’m not often moved by comics, or even novels, but this series has made me think about life and death in ways that have stuck with me. The seventh volume is out now and continues the story of Fushi as he tries to find a place in the world, which is hard when you keep getting your friends killed. Created by Yoshitoki Oima, who also created the bestseller A Silent Voice, this manga is above average in its art, its story, and most importantly its characters. As you follow along with them you feel like you’re witnessing their growth in real time. Read my reviews of volumes 1, 2, 3, 4, 5 , and 6 for more. This volume splits quite cleanly into three parts while developing one major element in regards to the villains Fushi must fight against. That keeps the narrative balanced and always pushing forward. In the first part, Fushi is still attempting to stay away from any humans so as not to bring giant killer monsters called Nokkers to their doorsteps. In fact, in the opening pages we learn Fushi has gone without human contact for 40 years, spending much of his time as fish and crabs so as to not think about all the friends he’s gotten killed by simply being around him. This allows Oima to progress Fushi’s perspective rather quickly so that when humans show up he’s at least a little bit inclined to help them so as to stomp out his boredom. Midway through Fushi must come to grips with a rising cult that may just become a religion if he’s not careful. This part integrates a young hero who knows his past thanks to a biography written about Fushi from a previous character. One thing leads to another with these sorts of things and you can tel Oima is developing a budding religion around the magical nature of Fushi. With it comes a respect and honoring for the Nokkers, too, and that adds a dangerous element that slowly builds as the story pushes forward. It’s interesting to see how the Nokkers are developing, which is a good thing since Fushi has slowly learned to take these things on with little damage. The last third of the volume shifts course towards Fushi learning about and fully embracing big city life. So far in this series he’s mostly kept to the woods or small villages and truth be told I’m not even sure cities existed when this manga started. That’s how much time has passed. It’s interesting to see human culture evolve, or at least for us to see it evolve before Fushi’s eyes. That adds another element of the human experience to be explored. This is a table-setting volume to be sure. Aside from the developments of the Nokker, and a key scene with Fushi and a familiar face, there isn’t that much being built up here. Instead, it’s mostly getting Fushi out of his rut and pushing him onto a new journey so he can get off the beach in that first page and off to point B where he’s needed for the story. That not only makes this volume a bit of a thumb-twiddling experience but it also makes it much easier to see the machinations Oima is imploring to move things along. I further felt this way about the narrative due to the lack of emotional resonance throughout this volume. There are still reflective moments that will hit you, but there are no great losses or great moments of emotion for Fushi or anyone else. A key scene that might have played that element up feels more like an afterthought thanks to the nature of the meeting. This continues to be a great series that holds up a mirror to humanity and the emotions that dwell within. I’m a bit sad to report however that this volume is more of a setup story rather than a full throttle exploration of what it means to be alive. After ending on an excellent chapter this volume begins to set up the next big arc as well as integrate a more modern society into its narrative.